We moved back to Utah in 2014. We also had two huskies. It was only natural to purchase a dog sled now play in the “World’s Greatest Snow.” The sled I purchased was a kit that you put together yourself. I bought the basic sled. It didn’t have all the bells and whistles. It didn’t even have a brake. However, it was enough to get us started. My oldest son and I took a morning and ventured up one of the nearby canyons. During the winter the canyon road is closed and people use it mostly for snowshoeing or cross country skiing. There was one rule that I insisted we follow: Don’t let go of the sled. One of us at all times needed to be holding onto the sled. The last thing I wanted to do that morning was track down two huskies hitched to a sled. We slowly made our way up the canyon. 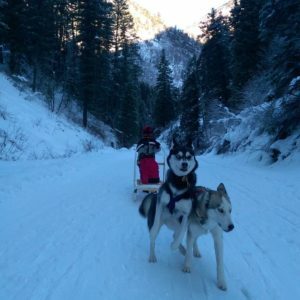 We would allow the dogs to pull us on the flat parts, but we hiked next to the sled for most of the uphill journey. With just the two of them, uphill was a lot of work for the dogs. After a few hours of hiking through the soft snow it was time to turn around and head back to the car. Only instead of walking next to the sled, we could allow the huskies to pull as we were now going downhill. Noah sat in the basket of the sled while I stood behind on the runners. The majestic scenery, time with my son, the dogs doing what they love, the whole adventure was magnificent! Everything was perfect. And then it wasn’t. The soft snow that we had walked up the canyon in had turned to ice. The sled didn’t cut through the snow, it slid on top of the slow. And remember the part about not having brake? I did what I could to drag my feet in order to slow us down, but it was no use. Everything happened so quickly. I lost control and was tossed off the back. I rolled and looked up to see Noah in the basket. Then the sled started to wobble and the then it tipped on to it’s side. Noah held onto the sled and was being dragged behind, serving as a break. Eventually the sled came to a stop! I ran down the hill shouting, “Noah! Noah! Are you okay?! What are you holding onto? Good times or bad, celebration or anguish, what are you holding on to? What are you paying attention to the most, what is your anchor? Hold to the upward call of God in Christ Jesus. Hold on to Jesus, he is an anchor to the soul. I grateful that we have a savior that never lets go! Jesus is holds all things together. Jesus is holding on to you. What are the things you are holding onto in this new year? And yes, I bought a brake for the sled. We also got another husky! Thank you Mike!! God bless your day. Thanks Stephanie! I hope you had a wonderful New Years!